Ah blog, how I’ve missed you. Between sailing 500 miles , starting a new job here, and gorging myself on veggies from my new Mariquita Farm CSA box this has been a very, very busy month. 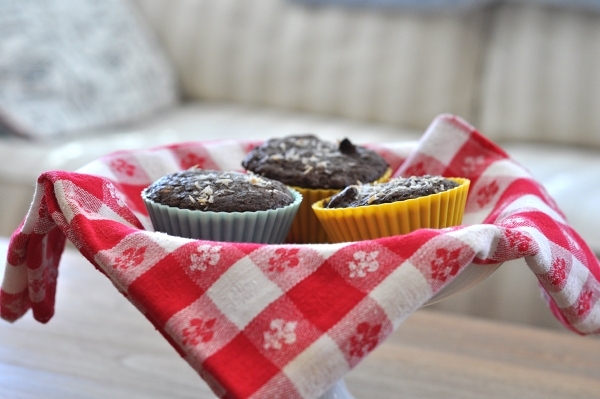 So busy, in fact, that it’s already time for another Vintage Recipe Swap! I know Christianna has been busy too. How she manages to keep all us swappers supplied with recipe inspiration while balancing the rest of her life I will never know. 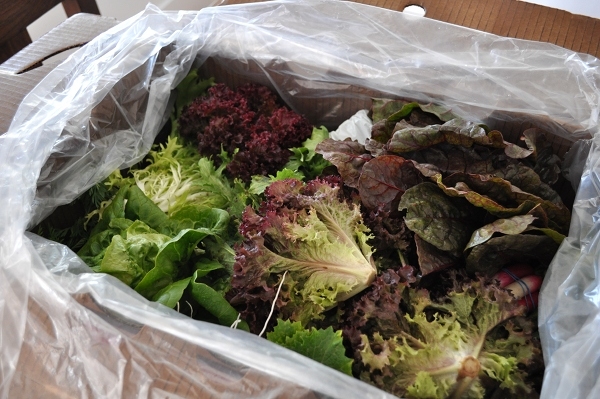 My first CSA box: gorgeous lettuce, frisee, green garlic, French radishes and much, much more. As crazy has things are these days, this swap was an easy one for me. 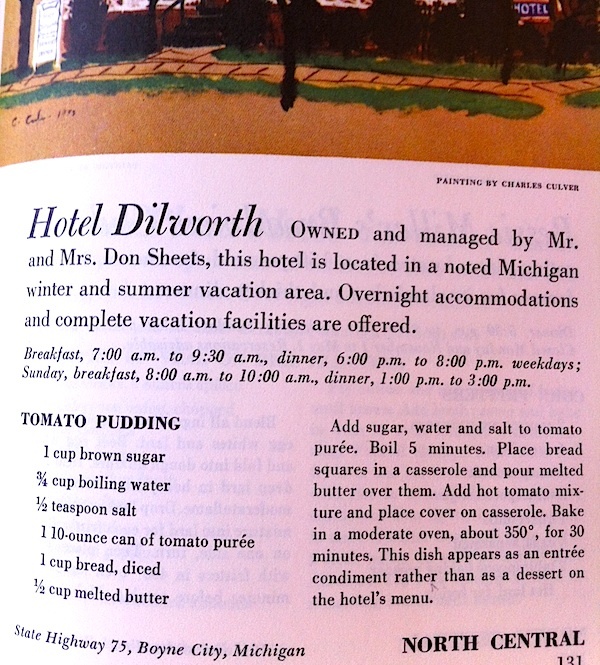 Tomato pudding, you say? A condiment for meat? What a waste of a good pudding! 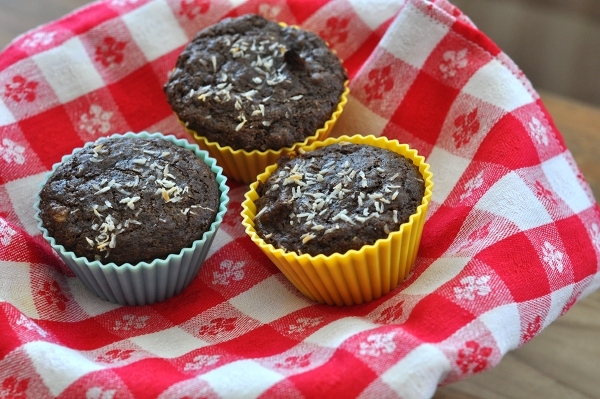 The recipe Christianna supplied this month is tempting enough to try unaltered. Since it isn’t exactly tomato season, though, I’m stashing this dish away for a summer day when tomatoes make an appearance in my CSA box. As odd as it seemed to use this dish as a condiment, I found myself taking the condiment route for my interpretation of “Tomato Pudding”. Ketchup, hot sauce, various vinegars, mustard, salsa…all those saucy spicy things we slather on our food are some of my favorite things to eat. I learned from my father to generously pepper and Tabasco my eggs. 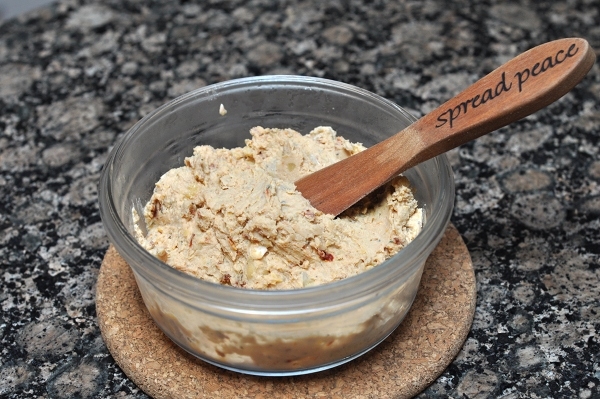 Lately, though, humus is undoubtedly my favorite topping, sauce, dressing, and spread. It’s multipurpose, healthy, and comes in enough variations to keep me entertained. Spread Peace and serenity for lunch time. I don’t know why it took me so long to start making my own humus, or to take the next step of cooking dried beans for that purpose. It’s not difficult and really doesn’t requite that much more time. Humus as become a staple of my busy work week lunches. I couldn’t dish out nearly as many sandwiches, salads, or dipping veggies as I do without it. It isn't pretty but I pomise it's good. I’ve made several humus and bean dip variations in the past couple months, playing with ingredients to get the optimum consistency and flavor. 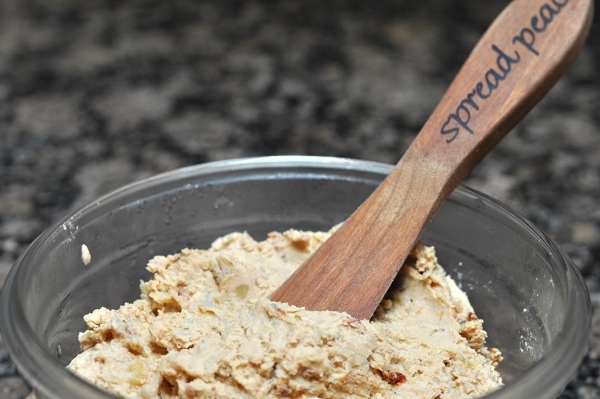 I encourage anyone who hasn’t tried it to make their own humus. Get creative with what you add and with how you use the finished product. I am completely addicted to humus + a splash of vinegar on a fresh green salad. My dad eats his humus on warm corn tortillas. My husband gobbles it with chips. I even stuffed wonton wrappers with one batch of homemade humus for some interesting ravioli. 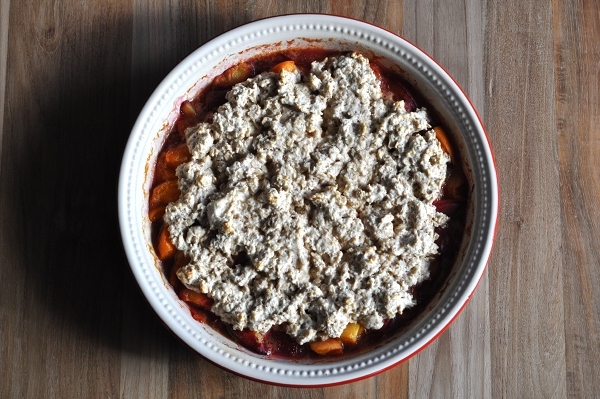 I stuck with the tomato theme from the swapped pudding recipe. Sun dried tomatoes are so perfect with chickpeas. The thyme came from last weeks CSA box. My oh my to I love my CSA box. This is my first experience with community support agriculture and I am in love. Give me a box full of fantastic green stuff every week and I will eat it, no matter how much there is! Cook chickpeas - I use a pressure cooker: cover the chickpeas with water in the cooker, add a tablespoon of olive oil to keep the froth down, cook for 7-8 minutes, remove from heat and allow pressure to come down naturally. Drain cooked or canned chickpeas. Place all ingredients in a large bowl (if using a hand blender), a food processor, or a blender. 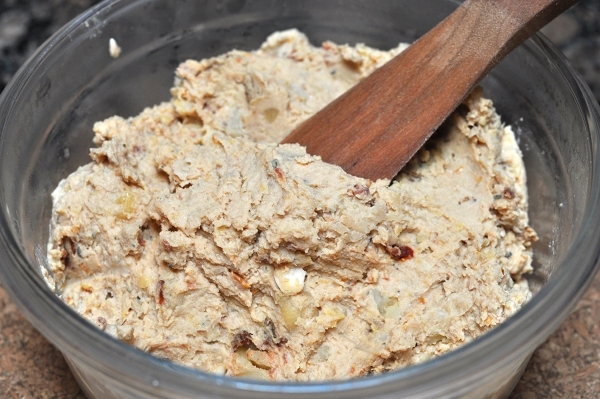 Blend until the humus reaches desired consistency, adding more water if you'd like it thinner or less for thicker humus. Store in an airtight container in the fridge or freeze for later use. Don’t forget, there are many other fantastic swappers out there! 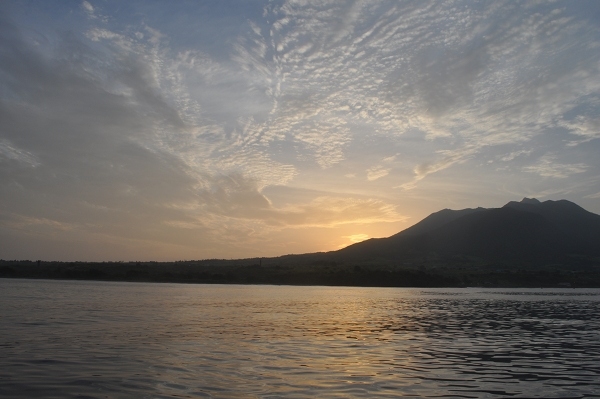 By now, I’m on the island of St. Kitt’s, trying to adjust to Caribbean heat and humidity. Today, my little brother turns 24. 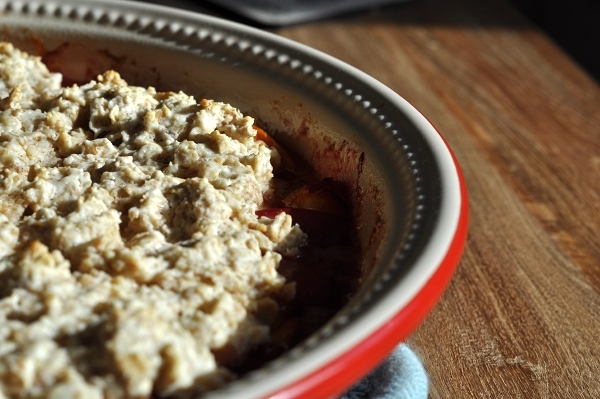 Today is also the first Wednesday Recipe Swap for Burwell General Store. Wow, there’s a lot going on! While it may sometimes come along during busy periods in my life, I have loved every single recipe swap since joining the group. I always learn something about a dish or two, about my own cooking, and about the astounding abilities of my co-swappers. This little activity has become so popular (yeah, we’re pretty cool) that Christianna, the swap’s founder, proposed that we split into two groups. There is now a Monday Swap and Wednesday Swap every month. Each group starts with a different recipe, making for even more delicious madness. As you can see, I fell in with the Wednesday swap crowd. I drooled over the Monday group’s pizza recipes earlier this month. At the time, I already had my own dish in the works, as I knew I’d be in the tropical wilds on the swap date. I smiled when I saw this months recipe. Ah, jello salad. My mom makes a jello salad, just one but it’s a good one. 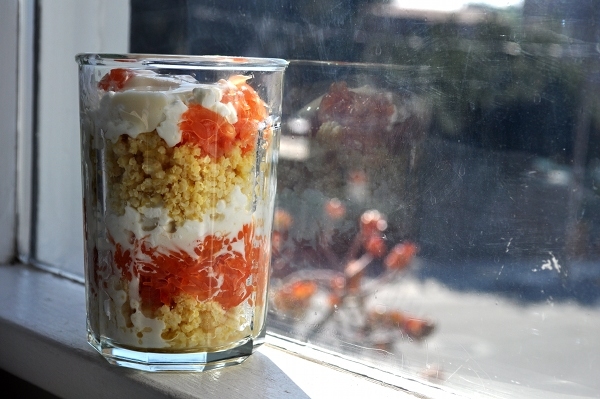 It incorporates all the wonderful things about jello salads: fruity jello, crunchy things, cottage cheese…I could go on. I actually kind of love it, although I’ve never made it myself. Anyway, back from that tangent. I didn’t make that salad, or any jello salad. After briefly considering an experiment with agar agar or unflavored gelatin I veered towards simplicity. A simple parfait is much more my style. 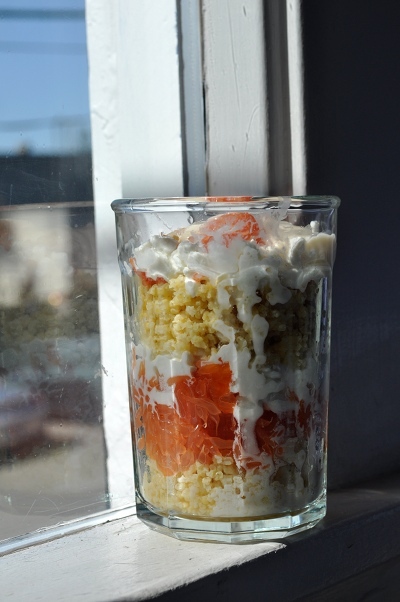 I carried the citrus and cottage cheese over from the original recipe but needed little else. I made this for lunch one day last week while I was trying to clean out the fridge and frantically ready myself for three weeks in the Caribbean. Breakfast might be a more appropriate meal for a parfait and it could certainly be a dessert or even dinner with some minor tweaks. The possibilities of varying the grain layer, sweetening the fruit, or maybe adding a layer of wilted kale and some savory spices make this an extremely versatile dish. My main inspiration was Joy the Baker’s Roasted Winter Citrus. I bookmarked this post last month because I love roasting everything and will try that technique on anything at least once. I’d never tried it with citrus fruit but the idea immediately had me thinking of hot sweet-sour juices paired with something cold and cheesy. I ended up roasted a sliced grapefruit, partly because I’m always looking for different ways to eat that somewhat challenging fruit. 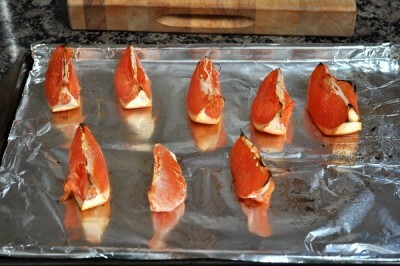 Layered with chilly cottage cheese and cooked millet, roasted grapefruit was truly delicious and different. Look at that soupy cottage cheese running down the inside of the glass. 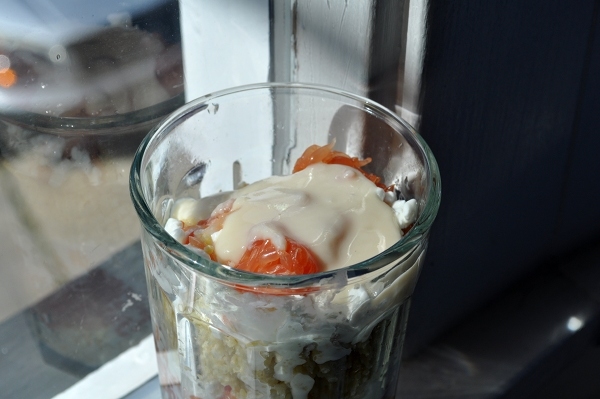 I wished I had my favorite cottage cheese on hand when I made my parfait. Nancy’s cottage cheese is cultured, like yogurt, so it’s tangy and richer tasting, even in a reduced fat version. I love it. 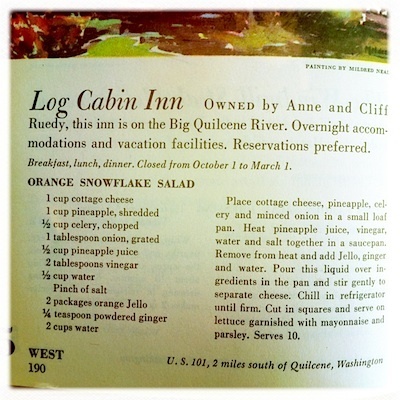 The pineapple in the original Orange Snowflake Salad seemed a little tropical to me. Maybe I just had the tropics on my mind, because knew I had to top my parfait with coconut butter. Coconut butter (like all nut butter) makes everything better, obviously. A more indulgent cook would have put gobs of this incredible spread/topping/syrup between every parfait layer. Next time. I’m not the only one taking jello salad in a totally different direction! Coconut butter, warmed in a bowl or pot of hot water so it is a liquid. Roast your citrus first, or maybe you have some leftover from another meal. In any case, cut fruit out of rinds once it is cool enough to handle. 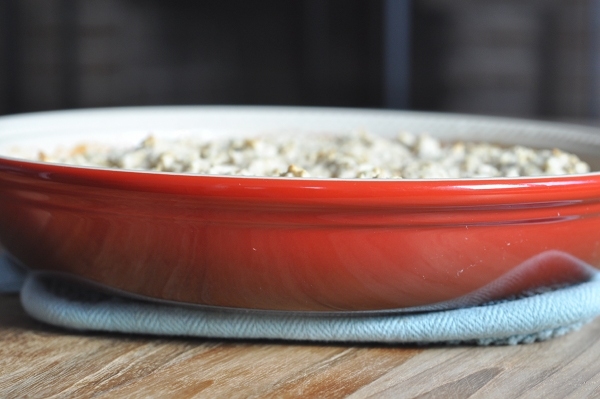 Spoon a layer of grain into the bottom of a pretty glass or dish. Follow that with a layer of citrus, followed by cottage cheese. Repeat layers until you run out of room or ingredients. Top parfait with a couple spoonfuls of coconut butter. In any case, cut fruit out of rinds when it is cool enough to touch. Spoon a layer of grain in the bottom of a pretty glass or bowl. Top that with a layer of citrus, followed by one of cottage cheese. Repeat layers until you run out of space or ingredients, finishing with fruit. 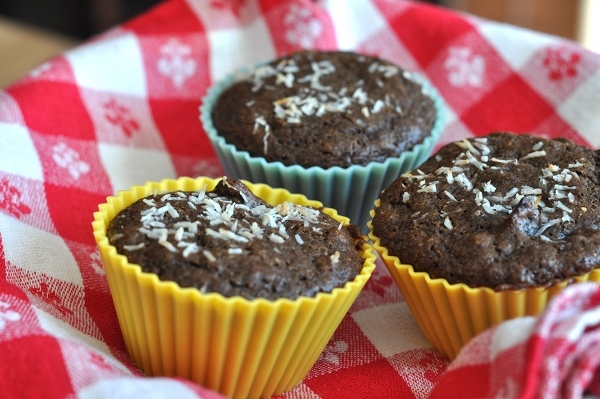 Drizzle a couple spoonfuls of coconut butter on top. Enjoy curled up on the couch, or maybe over the morning paper.